An in-depth look at Kirkwood, Atlanta. The Kirkwood neighborhood of Atlanta is a historic community of more than 3,000 households on the east side of Atlanta, a “small town in the big city. The original Kirkwood neighborhood, designed by architect Will Saunders in the 1870s, became a streetcar suburb of Atlanta by 1910. It's now entirely in DeKalb County and is bordered by Oakhurst, Edgewood, East Lake, and Lake Claire. While a few statelier Victorian style Queen Anne and Greek Revival homes occupy the neighborhood, Kirkwood is comprised mostly of the iconic two-story craftsmen-style American Foursquare homes and Craftsman bungalows. There are also a large number of the smaller tract-style homes typical from the post-World War II period. If you’re looking for a new home, whatever size or style home you prefer, Kirkwood has something to offer. Prior to the Civil War, the most prominent Atlanta families who owned land in Kirkwood were the Dunwoody, Kirkpatrick and Clay families. Many believe that "Kirkwood" is a blend of the Kirkpatrick and Dunwoody surnames. Kirkwood was the setting for several major events during the Civil War's Battle for Atlanta, and the Georgia Historic Commission has placed five historic markers across the neighborhood. Most notably, a marker that reads "The Battle for Atlanta Began Here," near the area where Memorial Drive crosses Clay St., signifies the start of the battle, when the first two brigades from each side crossed paths. Residential development began in the 1870's, and by 1910 streetcars began providing express service between Kirkwood and Atlanta three times per day. This continued until the early 1950's. Starting in the 1950s and leading into the 1960s, due to tension in the community caused by segregation and integration, the Kirkwood neighborhood saw a dramatic shift in its primary residents. In 1950, African-Americans comprised 0.3 percent of the Kirkwood population; by 1970, African-Americans comprised 95 percent. Starting in the 1980s, Kirkwood began to see a surge of new residents of all ages and races, who saw some of the historic homes as the perfect opportunity to renovate and take part in the American dream of homeownership. Thanks to a new diverse crowd of occupants, including a robust and supportive LGBT community, the Kirkwood community began to flourish as a diverse, inclusive neighborhood. In 2003, Kirkwood began renovations on a $1.5 million “streetscape” project that helped to remove urban blight, renovate streets, install paved pathways, and give community members regular everyday amenities such as trash cans and bike racks. The project also encouraged Kirkwood to become a more pedestrian/bike-friendly neighborhood by narrowing street crossings, adding bike lanes, and lowering the speed limits. Also, new decorative sidewalks are now adorned with historic street lighting. This revitalization has created a friendly, in-town living area filled with beautiful historic homes, business and work opportunities, and involved community members. Kirkwood is a convenient and centrally located Atlanta neighborhood. With the DeKalb Avenue Corridor just north of the neighborhood, Memorial Drive to the South, Mellrich and Winter Avenues to the East, and Rogers and Montgomery Streets to the West residents of Kirkwood enjoy having easy access to the central business district in Atlanta. Kirkwood is also located conveniently close to the Hartsfield International Airport and the I-20 and I-75/1-85 Highways. Kirkwood has its own MARTA east rail line station (East Lake Station) which provides neighborhood residents with easy access to the popular Atlanta neighborhoods and businesses of nearby Virginia Highlands, Little 5 Point, and East Atlanta. Whether you’re simply looking do some shopping or start your own business, Kirkwood offers art galleries, coffee shops, bars, restaurants, dance and exercise studios, hair salons, and a host of other offices and businesses. It’s not all business in Kirkwood; the residents like to have fun too. The Kirkwood Spring Fling, for example, is one of Kirkwood’s most popular annual events. Every year, Atlanta residents and visitors get to enjoy a fun festival which offers live music, an artists’ market, food from local vendors, children’s activities, and tours of some of Kirkwood’s historic homes. The Kirkwood Wine Stroll is an annual event in which attendees can sample wines sold by local businesses. It's hosted by the Kirkwood Business Owners Association, a nonprofit that promotes local businesses in the area. Kirkwood Family Find is a kid-friendly Easter egg hunt with 8,000 eggs hidden across Bessie Branham Park. Meanwhile, Home for the Holidays features holiday tree lighting, music and Santa Claus. And the Battle of Atlanta organization hosts an annual 5K race, along with event commemorating Kirkwood's role in Civil War history. Kirkwood is also only a few miles away from other popular neighborhoods in Atlanta, like Downtown Decatur and Little 5 Points, which have activities happening throughout the year. Kirkwood is also home to incredible restaurants, such as Zagat-rated breakfast favorite Sun in My Belly and local favorite gastropub The Pullman. Residents who are looking for a quiet nook to sit with their laptop can head to Taproom Coffee, a Kirkwood specialty coffee shop which (hint, hint) also serves craft beer. 1) Bessie Branham Park hosts Atlanta’s only Urban Treehouse, a $2 million recreational center, tennis and basketballs courts, a playground, and a state of the art computer center that offers free classes to Atlanta residents. 2) Coan Park features a disabled-accessible playground for children, outdoor gym equipment for adults, tennis courts, a baseball field, and an entertainment gazebo. 3) Gilliam Park offers green space, a bike trail which was begun as a part of the PATH project, and even a community garden. 4) The Kirkwood Urban Forest and Community Garden was established by residents who came together to transform seven acres of neglected city land into a city park and community garden run by local volunteers. 5) DeKalb Memorial Park, which is located at the southern edge of Kirkwood, hosts a basketball court, two tennis courts, and several athletic fields. Atlanta’s Kirkwood neighborhood is as diverse as they come. Historic homes, a unique past, one of a kind festivals, parks and greenspace, and passionate community involvement have all created the Kirkwood neighborhood that Atlanta residents know and love today. Although the neighborhood has really begun to blossom into its new identity in the past decade, there’s no telling just how much the neighborhood will transform even more for the better in the decade to come. With new Atlanta Beltline projects planned for the neighborhood, an influx of new businesses, and rising home values, Kirkwood is definitely one of the premier up and coming neighborhoods to watch out for in Atlanta. 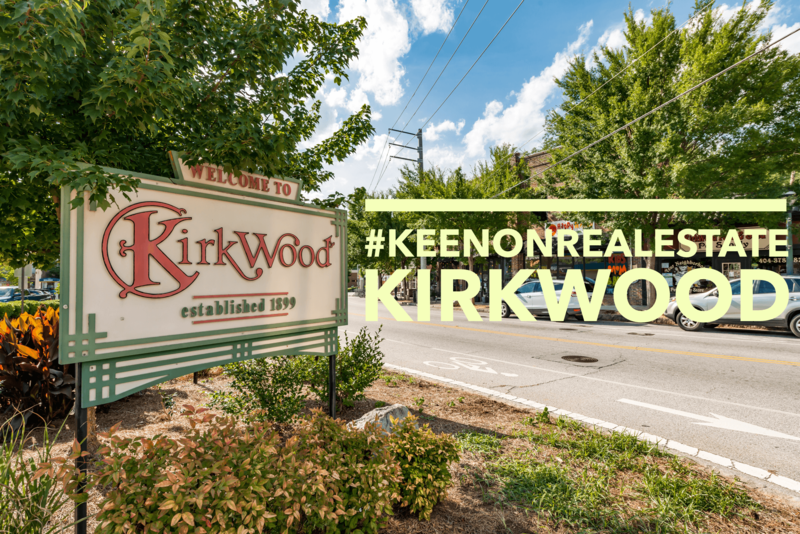 For anyone looking to call an Atlanta neighborhood home, business, home, and personal opportunities await in Kirkwood.